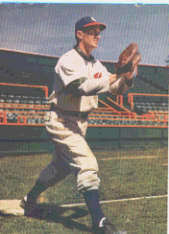 "Nick", who throws and bats left, started playing Professional Baseball in 1933. In 1944 when with the New York Yankees, he led the League in home runs and in 1945 led in runs batted in. He joined the Oaks in mid-season last year. Born in Chicago in 1914 of German descent, he's 6' 2" and weighs 198 pounds. He likes to bowl, read and go to movies. "An Ode to Nick Etten" . . . . by Dan Taylor. 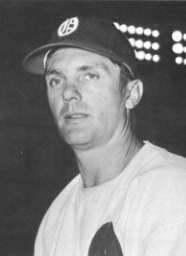 HEAR Oaks' play-by-play broadcaster Bud Foster and commentator Bill Laws relate anecdotes about Nick Etten in a 35 second, 360 kb .wav file. Simply click on the sounder icon below and wait for the file to load. It may take a short time to load, but it won't use up any space on your hard drive, and it is well worth the wait.